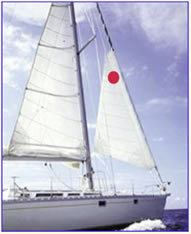 Gale Sail Type Sleeve Style Storm jib (goes over furled jib). Eliminates the dangerous job of unfurling, dropping and stowing the roller furling genoa in storm conditions to hoist a conventional storm jib. Since it is hoisted over the furled genoa, it provides many additional benefits over a conventional hank on or luff tape Storm Jib. Hoisting over the roller furled sail results in great aerodynamic shape, much better than a conventional storm jib hanked onto a removable headstay or a partially furled sail, (which most of the time has not been designed or built for that purpose). 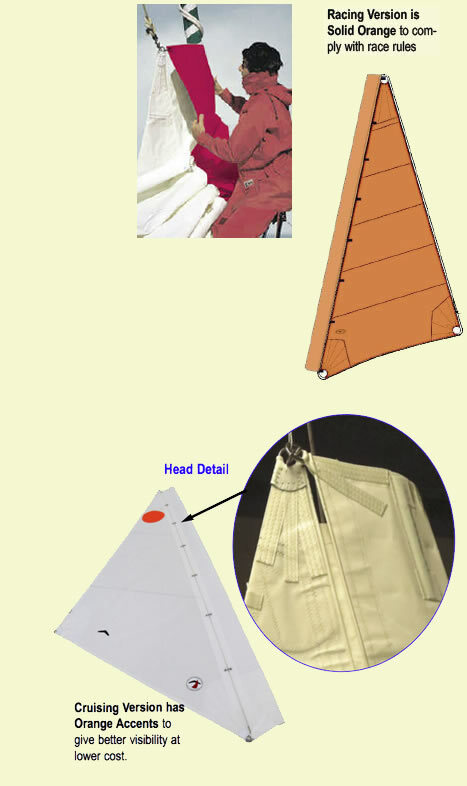 It requires less halyard tension than a conventional storm jib since its luff pouch is supported by the wide forward part of the roller furled sail. Published square foot size actually includes sail and luff sleeve. Actual sail working area is less.